German Talmudist; flourished in the twelfth and thirteenth centuries. He was a grand-nephew, and probably pupil, of Ephraim b. Jacob of Bonn. Like his father, Jacob b. Gershon ha-Gozer, he was a mohel, continuing the work, begun by the latter, of collecting the regulations and customs relating to circumcision. He wrote "Kelale ha-Milah," rules for circumcision, describing in detail the process of the rite according to the Talmud and the works of the Geonim and the later halakists; it contains also notes on the liturgy of the day. 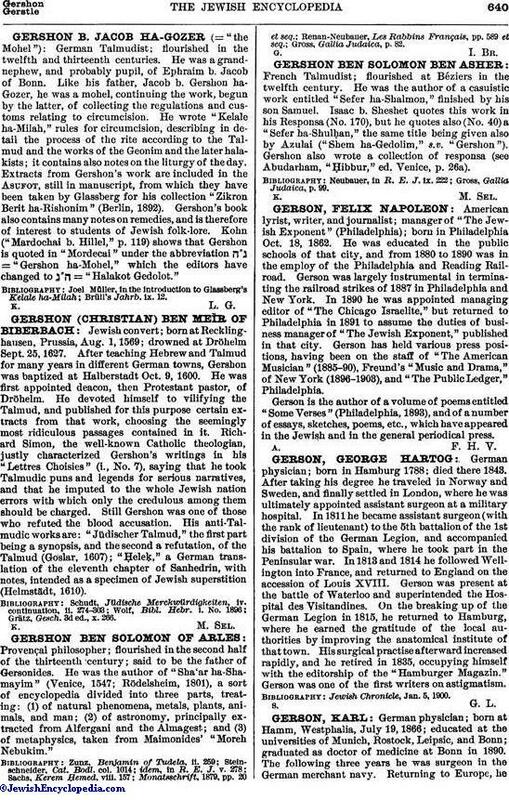 Extracts from Gershon's work are included in the Asufot, still in manuscript, from which they have been taken by Glassberg for his collection "Zikron Berit ha-Rishonim" (Berlin, 1892). Gershon's book also contains many notes on remedies, and is therefore of interest to students of Jewish folk-lore. Kohn ("Mardochai b. Hillel," p. 119) shows that Gershon is quoted in "Mordecai" under the abbreviation ="Gershon ha-Mohel," which the editors have changed to ="Halakot Gedolot."